If you’ve ever ended up on a Tinder date with a swamp monster, you’ll know that there’s often a big difference between promise and reality. That’s never been more true than with virtual reality. The promise: immersive, engaging, thrilling adventures, the likes of which you’ve never experienced before. The reality: shoddy looking rollercoaster footage straight from those wiggly VR machines in run-down arcades. 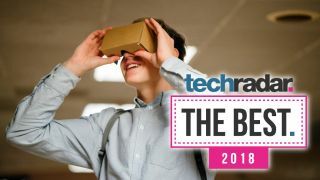 But don’t despair, because while Apple hasn’t flung its considerable weight behind VR just yet – the fabled iGlasses remain a rumour, although we know Apple’s interested – there are some pretty good VR experiences you can play on your iPhone right now. The cheapest way to get into iPhone VR is with a Google Cardboard headset, or you can invest in a pricier, more comfortable setup like the Zeiss VR One. Space games are brilliant in VR for all kinds of reasons, but the main one is that if you’re in the cockpit of a spaceship you don’t get the motion sickness that makes many of our VR sessions end with us throwing up into a bin. End Space VR is an accomplished and entertaining space shooter, although you might find the controls take a bit of getting used to: you manoeuvre by looking where you want to go, which is very weird if you’re used to WASD controls on computers or thumbsticks on console. Using a keyboard or controller to move makes much more sense, but of course when you’re using your phone for VR the touchscreen is strapped to your face. The game does support separate gamepads if you have one, though. It’s a beautiful game, and if you stick your earbuds in it sounds pretty great too. Sometimes all you need to sell something is a good title. Snakes on a Plane. Attack of the 50-foot Woman. Romans From Mars. Romans? From Mars? That’s right. Romans. Fom Mars. We’re not entirely sure the story is historically accurate, but in the game you take on the role of a Roman soldier whose job is to use his trusty crossbow to defend the Earth from the god Mars, who apparently comes from Mars, and his army of Romans, who also come from Mars. It’s simple and gloriously silly stuff, and while the VR is hardly essential – the game also exists in 2D, and VR doesn’t inform the gameplay at all; it’s just used to control your aim instead of a touchscreen or thumbstick – it does make everything feel a little more immersive than in its non-VR incarnation. It’s a straightforward shooting gallery that’s a lot of fun. Boo! That might not seem scary, but if this sentence had jumped out of a cupboard in a dark room while a minor piano chord boomed you’d have got a fright. And you’d have jumped even higher if you were in the middle of Sisters, which uses the tried and tested mechanics of spooky gaming – dark rooms, flashes of lightning, ominous low-frequency rounds and disembodied voices – to deliver something that’s rather unsettling and very claustrophobic. It’s one of those VR games you really need to experience while wearing headphones, as the audio is a huge part of the overall experience. It’s considerably less spooky if you have a zany breakfast radio show playing in the background. The developers use the word “experience” a lot because it’s more of a cinematic experience than a playable game: your involvement is largely about looking around as the experience unfolds. That means it’s really a one-off rather than something you’ll keep returning too. Not to be confused with the much more polished game of the same name for the HTC Vive, VR Sniper is a fairly simple and fairly short shooting game. As the name suggests you’re a sniper, and your job is to kill ten enemy soldiers. To do that you really only need to give them a good hard stare: the game takes care of the actual shooting once you’ve held your gaze for three seconds. The game takes place against a ticking clock, although you can disable that if you don’t want to play timed rounds. It’s an interesting idea, albeit one that can’t really sustain a long game, so it’s probably for the best that VR Sniper only has a few levels: they were previously locked behind in-app purchases but now the whole thing is free. It’s ad-funded but the ads have been made less frequent after some players complained about them. You don’t need VR to enjoy Fractal Combat X, but it’s a lot more fun if a lot more fiddly too. You’re in a plane, the bad guys are also in planes, and your job is to shoot them down to a soundtrack of hilariously clichéd action-game music and robot lady voices. The VR works well, although some bits of the on-screen interface are really, really small, especially the bits between shooting sessions, and it’s very fast and visually appealing. It’s important to note that this is a casual game, not an immersive fight/flight sim: if your idea of a good time is piloting fighters for hours, Fractal Combat X will bore you to tears. It’s very repetitive, the missions are very short and it’s best suited to quick sessions when you really want to shoot things but don’t have much time to do it. Point-and-click adventure games work really well in VR, and Hidden Temple is a really good example: the gameplay is fairly simple – look there, move over there, use this to open that – and the relaxed pace suits VR very well. The controls are forgiving too, which you’ll be glad about when you’re faced with a room full of things you need to jump across. The story itself is fairly hackneyed: you’re trapped in a temple and if you don’t find a way to escape it’ll become your tomb. But that means the game can have some fun with the room-escape tropes such as magical masonry puzzles, occult objects, flaming torches and jewelled keys. If your idea of a good time in a temple involves punching mummies in the face this isn’t the game for you, but if you like to think your way out of traps it’s an entertaining virtual place to spend some time in. Germbuster is different from most iPhone VR apps because it can use hand tracking as well as head tracking thanks to RealControl, which you can build for free: it’s a giant QR code you can print out, glue to a bit of cardboard and use in conjunction with a Google Cardboard headset. The game itself is really best suited to younger players. It presents you with a range of virtual rooms, and your RealControl becomes an on-screen bubble gun that you use to destroy the waves of germs infesting the place. It’s not remotely scary and it isn’t difficult either: the main risk isn’t from the germs but from the sometimes achingly slow delay between aiming your bubble gun at something and the bubbles destroying it, and we found the repetitive music got really annoying really quickly. It’s more of a demo for RealControl than a game in its own right, but it should keep the kids quiet for a while. In the immortal words of A Tribe Called Quest, can you kick it? Yes you can! Can you kick it? Yes you can! Can you – you get the idea. Final Kick VR is a football sim focused entirely on penalties, and you get to play both sides: first by aiming and curving the ball, giving it just the right amount of power to smack into the back of the net, and then as the goalie, your virtual gloves hovering in the air as you move them to catch the incoming ball. It’s simple stuff but it’s really well done, and the audio is great: the crowd noise follows what you’re doing, so when the ball goes in they erupt in joy. The fake commentary is a bit repetitive but it does add to the atmosphere: who doesn’t like hearing “GOAAAAAAAL” when they score? The free content’s fairly limited but you can unlock everything for a small fee. The graphics quality, we regret to inform you, is not quite superb. You fly a simply drawn spaceship through buildings and canyons in a world where curves, things to look at and windows on buildings don’t exist and where everything appears to be painted a light olive green. But, and it’s a big but, it’s really good fun. That’s mainly because the various obstacles move towards you at great speed, requiring some pretty fast reflexes to avoid impact, and partly because the soundtrack sounds like the intro to a Muse song. One of the good ones, the ones about drones or space pants or something. It’s simple, repetitive and pointless, and we like it a lot. We try hard and feeling the rush! Quite a lot of VR games are more about the VR than the game, and Zombie Shooter VR definitely falls into that category. While VR experiences such as PSVR’s Rush of Blood or Steam’s Left 4 Dead in VR Mode make good use of VR’s immersion to scare you silly, Zombie Shooter VR doesn’t. It looks like a decent first-person shooter set in spooky underground tunnels but its lumbering, shambling zombies aren’t remotely scary, and they don’t move quickly enough to pose any threat. We laughed at the YouTube review that suggested it was more of a “looking at zombies” app than a shooting game. That doesn’t mean it isn’t worth playing, although it probably isn’t worth unlocking the unlimited version. It’s fun to move about and the shooting’s okay until the novelty wears off. However, if you really want to shoot zombies in virtual reality you’d be better off with Steam VR on Mac or PC.